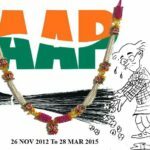 In what appears to be a pattern of escalating assaults on Aam Aadmi Party members, supporters of the BJP tried to bully 4 AAP volunteers out of public space in Varanasi asking them to remove their caps and go away. When AAP volunteers refused to budge failed a group of 15-20 BJP supporters brutally assaulted the four leading to somewhat severe injuries. The four were returning from an evening cleanliness drive at Durga Kund and singing patriotic songs as they headed for Assi Ghat. On the way back, they stopped at Kashi tea stall to drink water. Nandan, Kavish, Prabhat and Ankit were at the stall when the remaining group went ahead. 3-4 people approached them and told them to remove their caps. They refused. Ankit Lal claims that they had BJP badges, and AAP volunteers invited them for an impromptu debate rather than bullying tactics. BJP supporters left and joined a group of 15-20 people at a distance and returned with the group, while the AAP volunteers continued to chat with locals. The larger group threatened again. The AAP volunteers refused to obey, and said that if the BJP workers thought that hitting them would solve anything, they were welcome to try. The gang of BJP workers hit Nandan. Blood sprayed from his nose. Ankit Lal challenged them saying “You hit us and run and then call us Bhagoda.” At which a few of the BJP workers returned and hit Ankit and Nandan again. Both were hit multiple times. Prabhat who tried to save them also got hit. 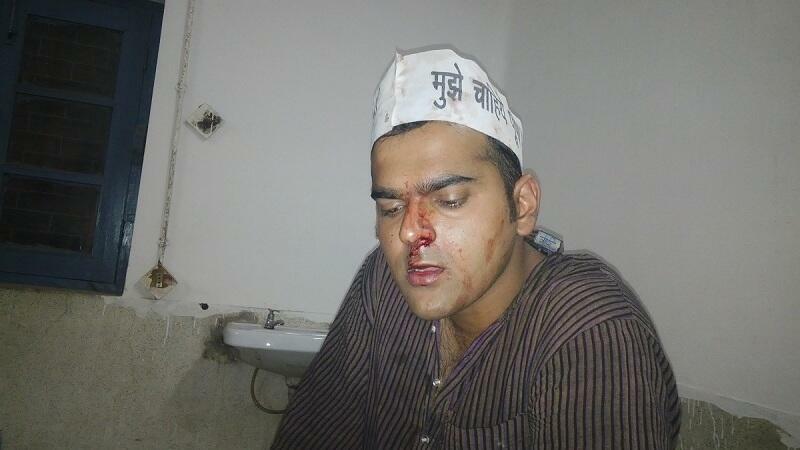 The BJP workers fled on bikes leaving Ankit and Nandan bleeding. About 30 odd locals were witness to this attack. They were rushed to Swami Vivekananda hospital, where doctors say that AAP national convenor for IT communications, Ankit Lal has damage to his left ear drum which will probably not result in hearing loss, but will take a painful week or so to heal. Nandan has a hairline fracture in his nose and will take longer to heal. Both of them are planning to return to the same place to sing patriotic songs tomorrow, as they had today. 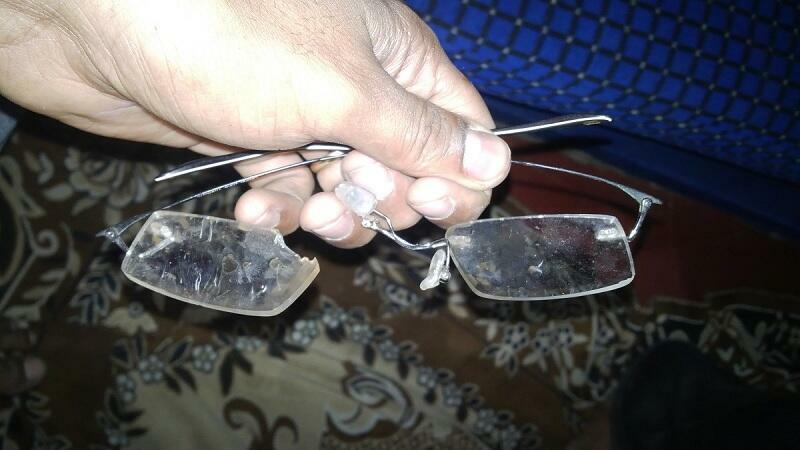 Ankit Lal took to Twitter on returning from the hospital in pain to narrate this incident. He was very clear that they did not obey, they did not back off, they did not retaliate and they will return tomorrow. In the meanwhile, anonymous BJP handles are attempting to portray this incident as locals hitting the AAP volunteers for drinking beer. It doesn’t get any more “shameless liar” than that. 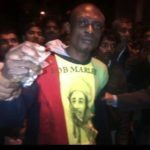 This attack is the latest installment in a series of attacks on AAP workers and leaders that are increasing in violence as elections draw closer. 5 days ago, BJP supporters brutally beat up Somnath Bharti and vandalized his car. 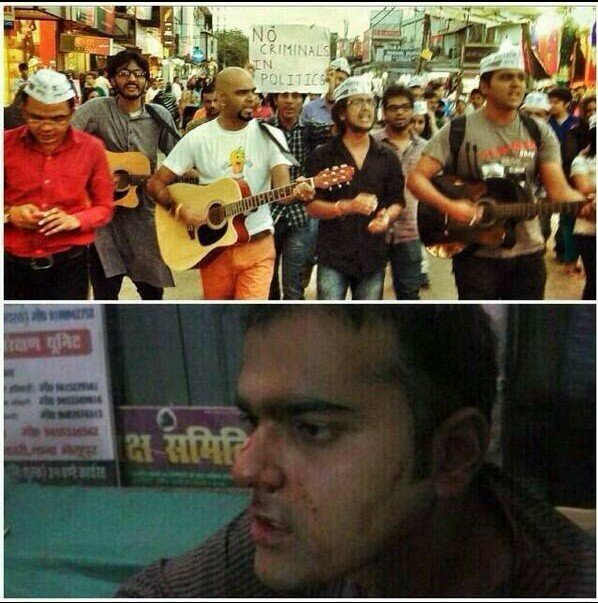 CNN IBN journalist showed remarkable courage wading into the mob to protect Somnath Bharti. While most media blacked out this news, others seem to be pretending that Somnath Bharti was attacked by nameless people and AAP is blaming BJP. 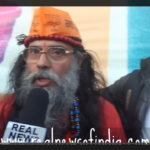 It appears that BJP supporters on shows too are not BJP enough for media with a motive. BJP is getting more and more desperate. Purchasing media, using violence, intimidation – they are no different than bandits who want to loot the poorest of poor while kissing the asses of the rich. Worse than even the most insignificant worms. Contrast to that AAP has people standing up for the rights of indefensible against exploiters.